Laugh. Die Laughing: Killer jokes for Newly Old Folks, selected and annotated by William Novak, author of The Big Book of Jewish Humor. Some good laughs about aging and forgetfulness in some of the stories and especially the quotes from comedians. Some are just funny in general without being specific about aging. If you’re an older married person, you may or may not appreciate the many jokes in here that are built on the idea of how miserable a man is with his wife and a few, vice versa. If you’re an avid emailer who receives frequent jokes from friends, you may recognize quite a few of the stories in here. In any case, you’re bound to find some that are new and entertaining. Cry. 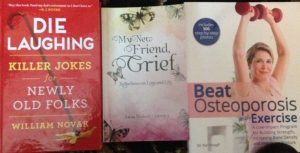 My New Friend, Grief: Reflections on loss and life, by Anna Hodges Oginsky. Processing a loss is never easy. The social worker author reflects on how her father’s sudden death awakened memories of previous traumas she’d experienced. She writes about how she got help in processing her many painful, negative memories, how she began to be able to see her grief as a positive force and how she came out feeling stronger and more peaceful afterwards. Because the book is about getting perspective, it may not be good for those newly in the throes of grief, but could be good to keep on hand for when they are ready. Exercise. Beat Osteoporosis with Exercise: A low-impact program for building strength, increasing bone density and improving posture, by Dr. Karl Knopf, a physician who was also a personal trainer and has worked with older adults and disabled persons for four decades. Growing older doesn’t have to mean extreme muscle loss and broken bones. The secret, says the author, is doing specific exercises and stretches that address the core protection against fractures – strong muscles, solid bones and the best possible posture. He points out that building these things begins in childhood, and that it’s never too early to begin. “Eighty-five to 90% of adult bone mass is acquired by age 18 in girls and age 20 in boys.” So the recommendations in this book are good for both you and your grandchildren – fun, healthy things to do together. Cook. 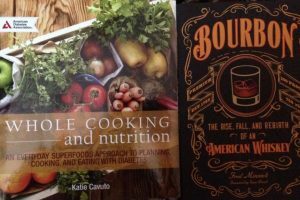 Whole Cooking and Nutrition: An everyday superfoods approach to planning, cooking and eating with diabetes, by Katie Cavuto, nutritionist and wellness expert. It’s not often we turn down so many pages in a cookbook on our first trip through it, but that’s what happened with this book. We love that every dish uses creative combinations of ingredients and encourages the reader to discover all kinds of new healthy-eating options. For example, ever heard of tempeh? Well, it’s a fermented soy product from Indonesia that’s firmer and more distinctive tasting – nuttier – than tofu. Check out the recipe that combines this with white balsamic vinegar, citrus juice and don’t-you-just-love-it? orange zest – ginger, soy sauce, garlic and more seasonings with greens. It sounds so delicious we don’t even care that we’ve never liked tofu. How about roasted cabbage steaks with vinaigrette? You don’t have to be diabetic to find pleasure in these recipes, and you don’t have to spend a fortune to get all the benefits of the super nutrition in them. Drink. Bourbon: The Rise and Fall and Rebirth of an American Whiskey, by Fred Minnick. If you like bourbon and you love history, this might be the right book for you. The author scores American whiskey for Whisky Advocate and has written a number of books about bourbon whiskey, including Bourbon Curious: A simple tasting guide for the savvy drinker (review here). This book focuses on the role of bourbon in American culture and traces its resurgence as a favored spirit in current cocktail culture. Minnick details the rise and fall of various distilleries, bootleggers, marketers and more. Ideally, you should be really into history to appreciate the level of detail here, but it might be fun for any bourbon devotee. 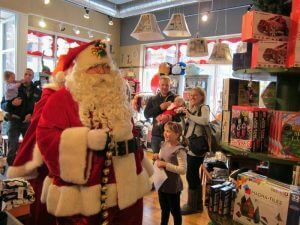 Santa Claus is coming to town and making a stop at The Red Balloon Co. this December. The store offers unique kids’ clothes, including Cubs gear and lots more. Santa and Mrs. Claus will be visiting with children young and old. Bring your Christmas list and get ready to smile pretty for a picture with Santa, no purchase necessary.